White Nationalist Groups Increase Recruiting Efforts On College Campuses The Anti-Defamation League says white supremacist propaganda has increased by more than 180 percent in the past year, as the groups seek to recruit disaffected white kids looking for community. 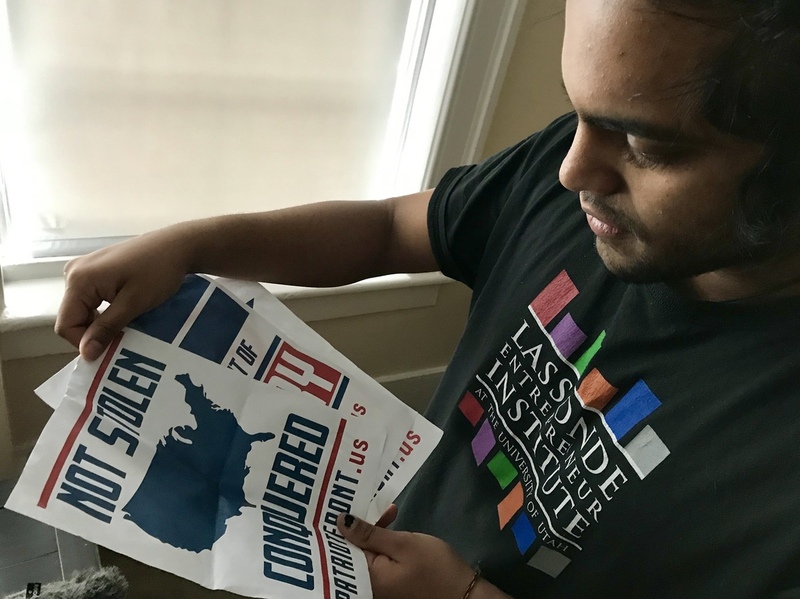 Mohan Sudabattula, a senior at the University of Utah, shows posters he found on campus from the white nationalist group Patriot Front. Authorities are looking into whether the suspect in last week's terror attack on two mosques in New Zealand was inspired by an emerging, European-based breed of white nationalism. The identitarian movement, formed in France in 2016, broadly believes that white people in Europe and North America are being displaced by non-European immigrants. Over the past few months, groups affiliated with similar ideas have protested and put up posters across college campuses in California, Utah, Wyoming, Colorado and Montana. Their members are mostly anonymous, and they espouse racism and hate online. University of Utah senior Mohan Sudabattula recently found white nationalist posters hanging from the side of the art building on campus. The first-generation son of immigrants from southeastern India was surprised but not shocked. He had seen similar posters — the red, white and blue lettering — popping up all over campus. Sudabattula snapped a couple of pictures and sent them to friends. Then he tore the posters down and stuffed them in his pockets. When he got home he hid them in a dorm bathroom cabinet for a week, until he agreed to show three to a reporter. The posters were from a white nationalist group called Patriot Front. Sudabattula shuffled them in his hands. One had a map of the United States on it with the words "Not Stolen, Conquered." The slogan suggests a reference to America's complicated history of breaking treaties and taking land from indigenous people. The other slogans are more vague. "The posters are pretty clever with their wording," Sudabattula said. "They don't really come off as harmful right out of the gate. But then you go online and the manifesto is a direct call to action against people of color." Founded two years ago in the aftermath of the white nationalist rally in Charlottesville, Va., Patriot Front has been labeled a hate group by the Southern Poverty Law Center, one of a handful of organizations nationwide that tracks such organizations. According to a new report from the center, white nationalist groups such as Patriot Group are on the rise across the country. In recent months, campuses across the west — including the University of Montana, the University of Utah and the University of Denver — have seen a rash of pamphleting, protesting and recruiting efforts by Patriot Front and another white nationalist group, Identity Evropa — recently rebranded as the American Identity Movement. Across the country, the Anti-Defamation League says protests and posterings increased by more than 180 percent in 2018. Universities have condemned their actions. "These cowardly, faceless and non-university sanctioned tactics are designed to disrupt and frighten individuals and communities, and to garner attention for an insidious ideology that has no place on our campus or in our community," University of Utah president Ruth V. Watkins said in a statement released in January. But that attention also seems to spur these groups. "I'm loving the tears over our latest activism in Utah, but it's odd because most actions — even those that receive mainstream media coverage — rarely generate this much outrage," Patrick Casey, executive director of Identity Evropa, wrote in a tweet. "I suppose that means we'll have to ramp things up in Utah!" I’m loving the tears over our latest activism in Utah, but it’s odd because most actions—even those that receive mainstream media coverage—rarely generate this much outrage. I suppose that means we’ll have to ramp things up in Utah! Richard Medina, a geography professor at the University of Utah, believes Identity Evropa and Patriot Front are coming to the mountain west because, while the region is predominantly white, it has a growing Latino and immigrant population. "They're focused on the Rocky Mountain region because there's a lot of change going on," said Medina, a co-author of a recent study on the geography of hate groups. "Like a lot of these groups, their main motivation is, in some ways, a resistance to change." "They're reframing themselves as victims," Medina added. "It's working, sometimes, for young white kids who feel victimized in a lot of other ways. It gives them a group to feel welcomed in." Patriot Front and Identity Evropa have their roots in the far-right, white nationalist movement known as the identitarian movement that has spread throughout Europe and into the United States. The movement frames changing demographics from immigration as white genocide. "These people see themselves as victims and that the whole European, white culture and ethnicity is going to go away," he said. Medina isn't sure whether the recruiting tactics at the region's college campuses will work, though. "I think they've come here because they see some opportunity," he said. "Whether or not they believe they can recruit some members or whether they can get a message to people that they believe are like-minded, I'm not sure." For Sudabattula, these hate groups might be new to the region, but the racism feels familiar. When he was young, his family lived in Kentucky for a time in the immediate years after the Sept. 11 attacks. "Things started to get a little stressful at school. My dad was experiencing some workplace hostility," he said. To leave that environment, the family moved to a Salt Lake City suburb, to a state that prides itself on being friendly to immigrants and refugees. But even there, he said, some white people he met were tone-deaf. "'You're like the coolest Indian I know,' implying that everyone else is odd or unusual," Sudabattula recalled what some would tell him. "Or, 'Oh, I love your people, your country. I served a mission out there.'" He says it was subtle and sometimes unintentional — like a little ember of racism in a fire pit. Now Sudabattula believes white nationalists are coming to the west to blow on that ember. "You have a bunch of people who are now trying to approach passive white folks and they're basically saying, 'Look: We all agree on the same thing. We think that minorities are different. But we don't have to cater to their needs anymore. This is our home and they are coming here,' " he said. Sudabattula said the rise in hate here is scary, and that it's up to white people in the region to step up and take action. "At the end of the day, the hate groups look like my friends," he said. "And my friends, I think, are in a different position to say something."